I absolutely LOVE my Clam Ice Armor fishing bibs. I honestly cannot stress it enough how impressed I am with them. I just wish I had a camouflage pair to wear in the duck blind…. I moved from Nebraska to Central North Dakota in the summer of 2017, spending most of my life open water fishing. Sure, I had gone on a few Nebraska ice fishing outings, but for anyone that has grown up in Nebraska, or states further south, you know that safe ice lasting more than a week is a bonus most years. North Dakota winters, however, would not be as forgiving…. Do your research and get yourself a good jacket and bibs made for cold weather. There are SO MANY different options available here that choosing can be difficult. I went with a budget option by a KNOW company in Clam and scored big time….. I picked up a pair of the Clam Ice Armor Extreme Bibs from Scheels in Bismarck and have nothing but rave reviews on these. I will admit though, I found them on a heck of a sale, and got lucky I happened to also make a good purchase. Why Clam Ice Fishing Bibs? I’m not going to lie to you….I chose these without ANY research whatsoever. I found them marked down and jumped on a good sale. I was a little nervous without first reading any of their many ice fishing bibs reviews. But I did so knowing what I had in the BRAND. This got me some of the warmest ice fishing bibs….heck, some of the warmest bibs I have ever worn. But, the Clam Ice Armor Edge bibs are more than warm. They hit on literally EVERY single need as an ice fisherman. Warmth – There are warmer bibs out there. But I have yet to be cold in these bibs. The biggest thing I look for in my fishing gear is room to layer, avoid the big and bulky. Nobody likes trying to fish when they can’t move…. The comfort of the Clam ice bibs are really second to none. No gimmicks here, this is quality and comfort at it’s finest. What makes the clam ice armor insulated bibs so warm? The 300D waterproof shell completely blocks the wind, eliminating any wind chill. These are also very breathable, eliminating any chill cause by sweat. There are FLEECE lined hand warmer pockets on the front, allowing easy access and a quick hand warm up. I put a rechargeable hand warmer in each pocket for optimal warmth. Comfort – As stated above, the Clam Ice Armor bibs offer plenty of room underneath for comfort and flexibility all without sagging. This allows easy layering underneath when needed. The adjustable suspenders are a nice touch, allowing a nice snug fit. The pockets on the front thighs are BIG and easy to access. Waterproof – This cannot be stated enough. This is a 100% waterproof bib, and it is not just a claim…they really are 100% completely waterproof. In my opinion, this is a MUST. Coming from a guy that used to hunt and fish in Carhart bibs……I never knew what I was missing with a good quality ice fishing gear. 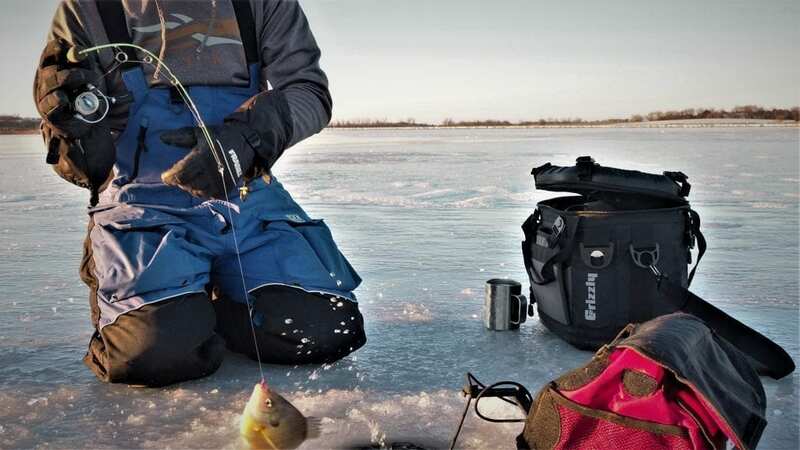 For the amount and kneeling on wet ice that occurs during an ice fishing trip….the waterproofing is a deal breaker. What often gets overlooked with bibs in general are the pants cuffs. The elastic pant cuff allows for a secure seal and easy application over your boots and the storm flap over the top of the cuff is completely splash proof. The padded and reinforced, 1000D ballistic nylon knees are also a game changer. I fish a TON and two seasons of kneeling on ice with ZERO issues. Durability is really top notch. 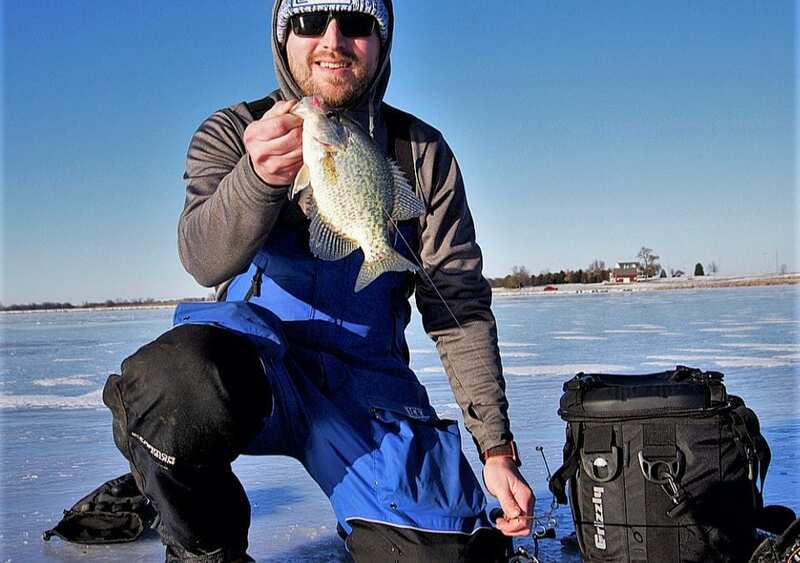 There are dozens of ice fishing bibs that offer all of these things and more. So why the Clam Ice Armor ? Have you seen the price? Ice fishing gear is EXPENSIVE….between a flasher, an ice house, and an auger…..you are talking well over a grand. No, I am not saying you should skimp on your clothing… that is the most important thing when it comes to ice fishing. You MUST be warm, you MUST be waterproof, and you MUST be comfortable in order to fish. But would you not want ALL of those things at a REALLY GOOD PRICE? The Clam Ice Armor ice fishing bibs can be found on Amazon for right around $160! Yes….$160!! I am intrigued by some of the floating ice fishing bibs on the market. I always carry a set of ice picks around my neck, but the added peace of mind and safety of a pair of floating ice bibs might be worth it to some. The Clam Outdoors name means something! With over 30 years of experience, Clam Outdoors has represented the outdoor gear industry. Quality is a top priority at Clam and it shows in their products. With such dedication to quality and user experience they are sure to stand behind their products. I have not had to deal with their customer service department, and I view that as a testament to their high quality products. I do not use enough Clam ice fishing products, but with my experience with the Clam Ice Armor Insulated ice fishing bibs, I will certainly be checking out any future products they release! We hope you enjoyed our Clam Ice Armor fishing bibs review. Our goal at Review Your Gear, LLC is to provide our readers with insight and first hand knowledge on outdoor products before and during the purchasing process. As always, we would love to hear any feedback from you. If you have any further questions on this product, please, send us an email! 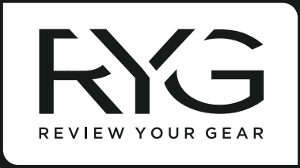 Also, be sure to check out our Instagram, Facebook, and YouTube Channel for the latest from us at RYG! Happy fishing and stay safe!